The conflagration which engulfed Notre Dame, Paris on 15th April cannot help to remind us of a similar disaster that befell the Australian Church on the night of 29th June 1865. After nightfall, it was noticed that the original Cathedral of Saint Mary in Sydney was ablaze. It is sometimes claimed that charcoals falling through the floorboards of the sanctuary during Vespers and Benediction earlier in the evening, were responsible for the blaze. Within a short time, the old Cathedral was engulfed in fire. Its interior, being almost entirely polished timber, was alight rapidly. The efforts of fire-fighters were of little avail. The courageous efforts of a few were responsible for the rescue from destruction of many of the Cathedral's treasures, and not least so the Blessed Sacrament, Reserved in a side chapel. A huge crowd of Sydney-siders gathered in Hyde Park and neighbouring roads to witness this terrible event. No such fire had hitherto been seen in Sydney. 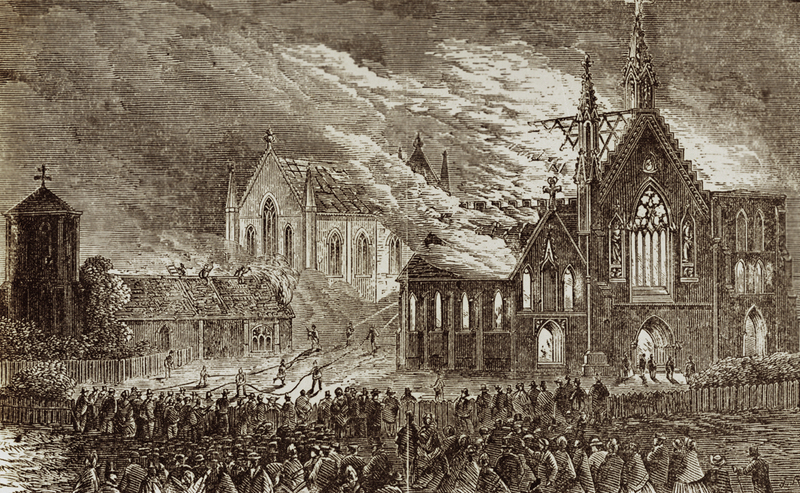 A sketch of the Cathedral fire on the night of 29th June 1865. By morning, it was clear that the entire Cathedral had been devastated, the interior completely gutted and the walls alone standing. Some of the stonework, notably the apse of the Cathedral, had collapsed in the blaze. Old Saint Mary's was not insured ... the scale of the loss was quite dreadful. We know now that a new and greater Cathedral was built after that disaster; but for Catholics, the destruction of their Mother-Church that night, was a terrible blow. On the night itself a few artists seem to have sketched the events of the fire and a number of illustrations appeared quickly in newspapers and magazines. We include here one of those sketches, which shews in great detail what was happening. Firefighters, assisted by volunteers, try to control the blaze, whilst many people, their faces lit-up by the flames, look helplessly on. 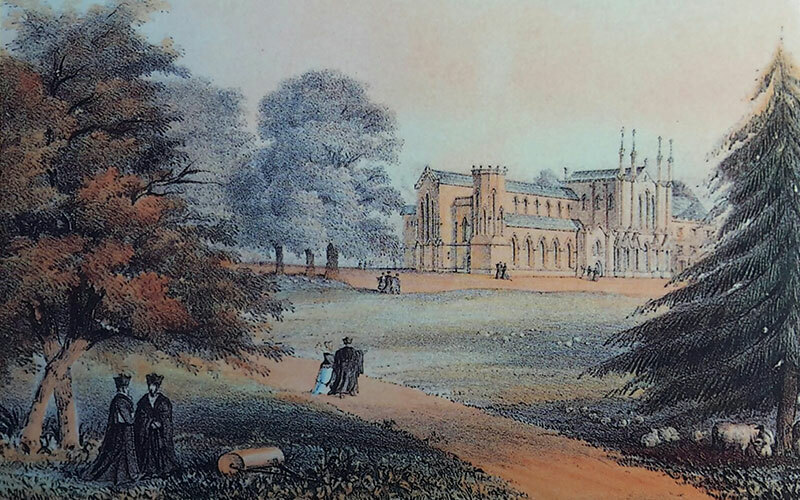 The next day, a photograph was taken of the ruins of the Cathedral, looking south-east from Hyde Park. It shews the complete destruction of the timber roof as well as the interior of the Cathedral. The apse of the Cathedral did not withstand the intensity of the heat and had collapsed. The final plumes of smoke can be seen emerging from the tracery window in the western facade (facing Hyde Park). The devastated shell of Saint Mary's Cathedral the day after the fire. Looking at these images and comparing them with those of Notre Dame in this week past, reminds us how quickly can be destroyed what has taken so long and so much to build. Ut in omnibus Deus glorificetur. Apart from the short reminiscences of some Catholic pioneers, Australia's first book of Catholic history was published in 1886 by a senior priest of the Archdiocese of Sydney. This was the Very Reverend John Kenny. 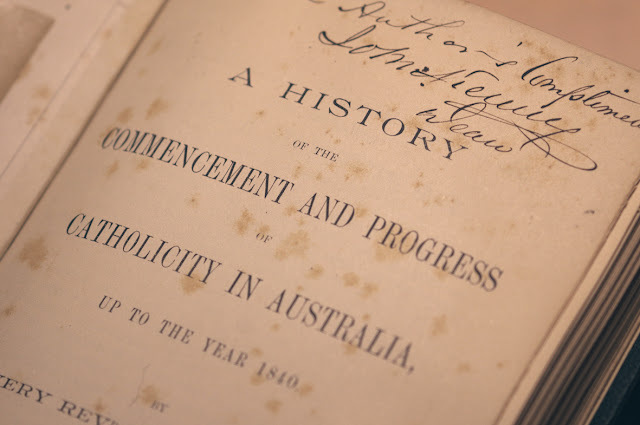 Dean Kenny's book was titled A History of the Commencement and Progress of Catholicity in Australia up until the Year 1840. These days, we would use the word Catholicism in place of "Catholicity". 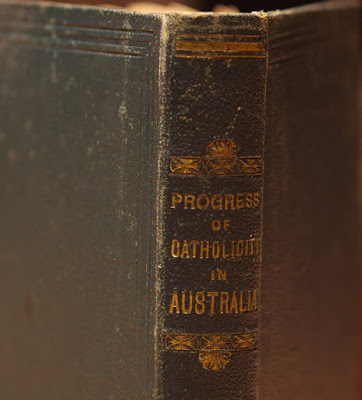 The object that I had in view in writing the history of Catholic events in Australia, was to correct the mistaken notions in the minds of many, in regard to our history, and to reduce them to something like chronological order ; and to show the wonderful progress of Catholicity in Australia in such a short time. I have been witness of many events recorded in the history. 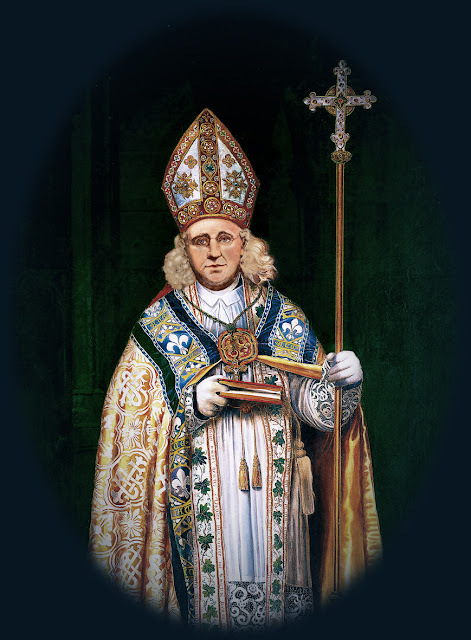 I came to the colony in the year 1835, with Bishop Polding, as an ecclesiastical student : it will soon be fifty years ago ; and I was not unobservant of what was passing. I was ordained a priest with four others, by Archbishop Polding, in the year 1843, and have laboured ever since on the Australian Mission. Dean Kenny 1816 - 1886. A carte-de-visite photograph of the 1870s. John Kenny was born in Fife, Scotland in 1816. In 1834, whilst still an ecclesiastical student, he was selected by Bishop Polding to be among the small party that accompanied him to the colony of New South Wales. Amongst this party, John Kenny seems to be the only one who was not himself (nor did he become) a Benedictine. In Australia, whilst still a student for the priesthood, he was mostly engaged as a catechist, whilst living at the seminary attached to Saint Mary's Cathedral. 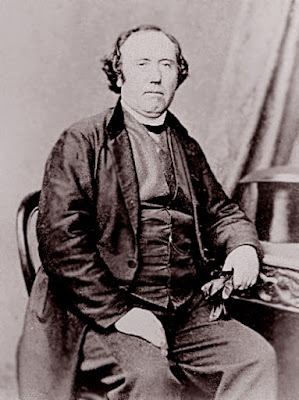 But after his ordination, Father Kenny was appointed to Queanbeyan (1843) and afterwards to Penrith (1844-45), Macdonald River (1845-47), Geelong (1847-48), East Maitland (1848-67) and finally North Sydney (1867-78), where he lived until his death in 1886. Although not in any respect a comprehensive account of the formative years of the Church in Australia, Dean Kenny's History is nevertheless much more than a mere curiosity. Perhaps its principal value is where it records events which Dean Kenny witnessed at firsthand during the first five years following the arrival of Bishop Polding in Australia, and the inclusion in the volume of sermons and speeches of Archbishop Polding and Father William Ullathorne, the Vicar-General, which otherwise might have been lost to posterity. 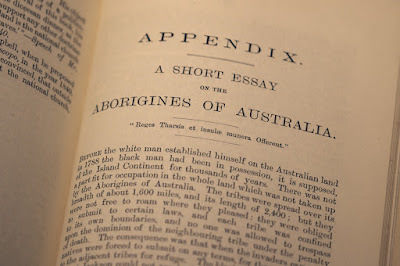 As an appendix is included A Short Essay on the Aborigines of Australia. 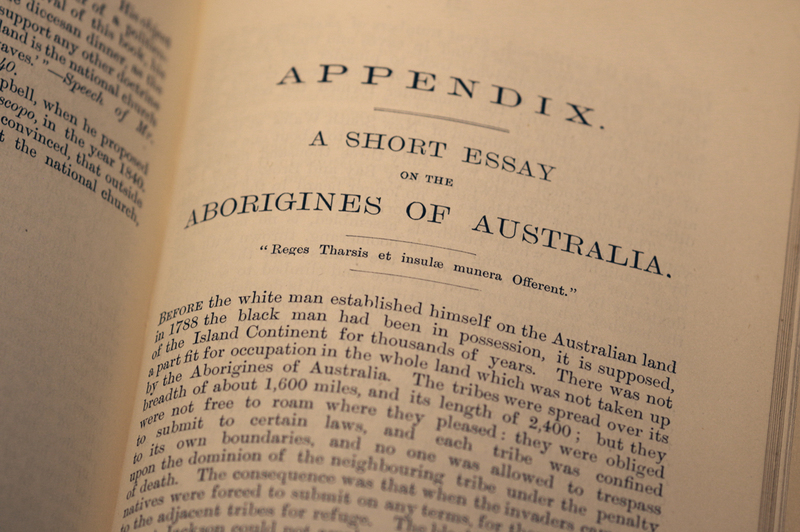 If nothing else, the inclusion of this Essay demonstrates that the culture and welfare of the Aboriginal peoples of Australia was not something ignored by the Catholic Church in the nineteenth century. Because Dean Kenny's History is such a rare volume, we take the opportunity to include some photographs of it. AMDG. 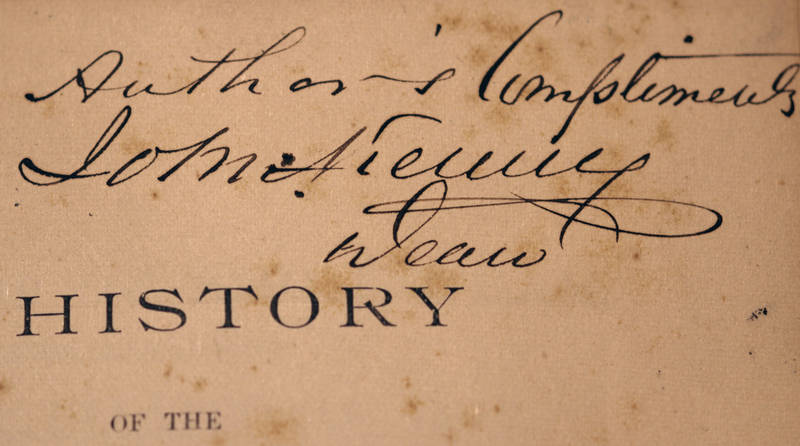 Title page of Dean Kenny's History. Dean Kenny was resident at Saint Leonard's in Sydney when he wrote his historical volume. "With the Author's Compliments John Kenny Dean." 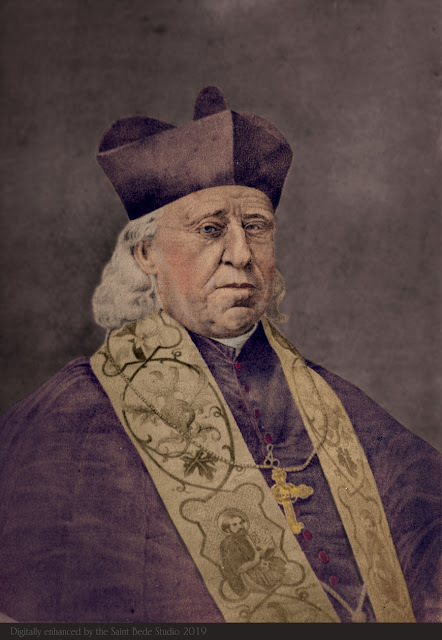 This portrait of Archbishop Polding, depicting him in his 70s, is the frontispiece to a rather rare historical volume, A History of the Commencement and Progress of Catholicity in Australia up until the year 1840, written by Father John Kenny, a priest of the Archdiocese of Sydney. When the volume was published in 1886, certain rare engravings and photographs of pioneering clergy were reproduced in it as a photographic plates. 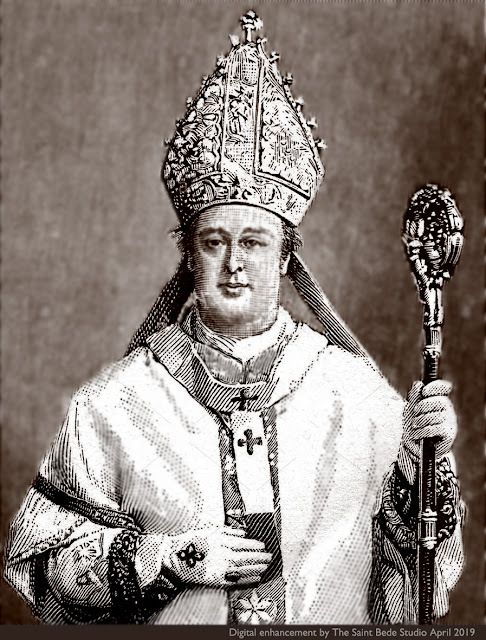 It would seem that the portrait of Archbishop Polding was based on a photograph taken in the later 1860s, but enhanced with some artistic detailing for the purposes of publication in 1886. 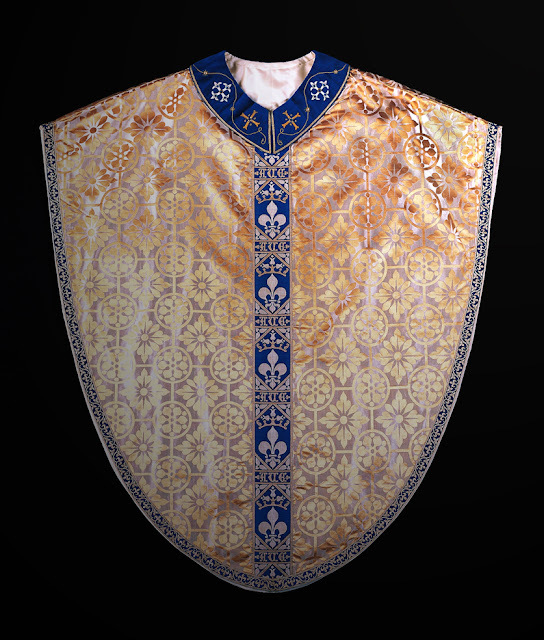 In this photograph, we can see the Episcopal stole which the Archbishop wore for several photographic sittings. It was a very long stole, terminating in tassles and untypical of the style of the period. Almost certainly the stole was made in Europe. It is embroidered with medallions depicting the saints, the two visible in this portrait being Saints Peter and Paul. The image has been digitally coloured and enhanced from the very faded sepia original. Archbishop of Sydney 1877 - 1883. When Archbishop Polding died in March 1877, his Coadjutor, Roger Bede Vaughan, succeeded him as the Archbishop of Sydney. Archbishop Vaughan had been a monk at Downside Abbey, England, before arriving in Australia in 1873. He also shared the enthusiasm for Gothic taste in liturgical paraments and architecture. In January, 1878, Archbishop Vaughan received the symbol of his office as Metropolitan Archbishop when the pallium was conferred upon him in Saint Mary's Pro-Cathedral. To commemorate this occasion, several photographic portraits were taken of the Archbishop, vested in pontificals. One of these photographs was reproduced as an engraving, which we are pleased to include here. Noteworthy is that the Archbishop is vested in a simple white Gothic Revival chasuble and an elaborate Gothic Revival mitre. He is also wearing Episcopal gloves and the pallium. The mitre and the crosier are still preserved in the treasury of Saint Mary's Cathedral. A photograph of the mitre, in its present rather faded condition, is given below. It is extensively embroidered, with jewels enriching it. One peculiarity - distinctly Gothic - is the metal filigree work which runs along the upper edge of the mitre on both sides of the front, terminating in a jewelled Cross. The precious mitre of Archbishop Roger Bede Vaughan OSB. Image : Tasmanian Museum and Art Gallery. In May 1841, Bishop Polding arrived in Europe to visit the Vatican and to encourage priests and religious to join the Australian mission. During this visit, Pope Gregory XVI established the dioceses of Hobarton and Adelaide and made John Bede Polding ARCH-bishop of Sydney and Metropolitan of Australia. The new bishops were Father Francis Murphy, pastor of Saint Patrick's Church Hill, Sydney, who was appointed to Adelaide; and Father Robert Willson, pastor of Saint Barnabas' church, Nottingham, England, who was appointed to Hobarton. In June 1841, Bishop Polding attended the consecration of a new Cathedral which had been built in the city of Birmingham, England. This Cathedral was designed by the emerging luminary of Gothic Revival art and architecture, Augustus Welby Northmore Pugin. Pugin was a once-in-a-century creative genius whose very name evokes wonder. Archbishop Polding was deeply impressed by the new Birmingham Cathedral and in general by the Gothic art which it incorporated. It seems it was a moment of revelation for the Archbishop, because he subsequently engaged Pugin to prepare some designs for churches in far-off Australia. He wished the architecture and art of his Archdiocese henceforth to be Gothic. The story of these Australian churches is intended for future posts. A Puginesque chasuble in the Collection of the Archdiocese of Hobart. In this post we will limit ourselves to a particular point about this Australian Gothic Revival. The Archbishop was quite taken with the sacred vestments which were designed and made under the supervision of Pugin for the Birmingham Cathedral's consecration. These vestments were more ample in their form, lavish in their colours and sumptuous in the materials they were made from. Over the next few decades, this new form of vestment, referred to as Gothic became common throughout Australia. The new Bishop of Hobarton, Robert Willson, was a friend of Pugin and an admirer of his work. 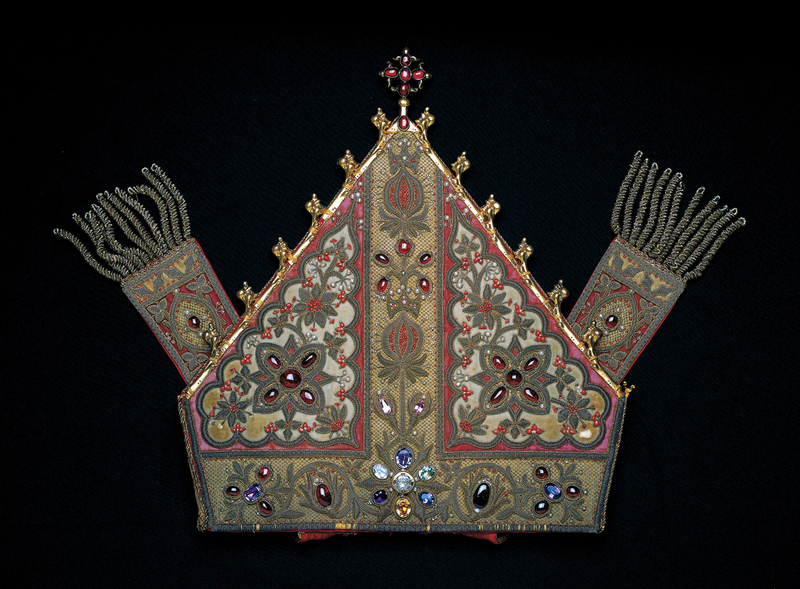 He acquired a great deal of Pugin's liturgical art, including vestments, for his diocese. Some of those early Sydney and Hobart Gothic Revival vestments were made in England, whilst others were made by Religious here in Australia. Happily, some of these old vestments still survive for us to admire. They an important part of our Liturgical Tradition and Catholic Heritage. 1. Figure 1 is a digital enhancement of the painting of Archbishop Polding which hangs in the Great Hall of S' John's College at the University of Sydney. In this painting, the Archbishop is wearing a splendid cope of figured gold silk, which was presented to him by a member of the English Catholic nobility 1855-56. 2. Figure 2 depicts the front of a Gothic Revival chasuble in the collection of the Archdiocese of Hobart. This Marian chasuble, of a beautiful ivory and gold figured silk, was made shortly after the death of AWN Pugin in 1852, but closely based on his designs. The orphrey of this chasuble is identical with that of Archbishop Polding's cope, shewn in Figure 1. 3. We are indebted to Mr Brian Andrews of Hobart for his seminal research into Pugin's role in the development of an Australian Catholic aesthetic. Downside Monastery in Somerset (England) shewing the buildings constructed in 1823. These buildings were constructed whilst Dom JB Polding was part of the monastic community. Image : Downside Abbey website. In March 1819, in the small chapel of a great house in Wolverhampton, England, a young monk from Liverpool was ordained a priest. He belonged to a community of Benedictines who had re-established themselves in a new monastery at Downside, in Somerset only a few years before. The young monk offered his first Mass solemnly at Saint Gregory's Monastery, Downside on Saint Benedict's Day, 21st March 1819, two hundred years ago today. This was Dom John Bede Polding. His young life and his initial priestly ministry was based in monastic communities. But in 1834, the Holy See selected Father Polding OSB to become the first Catholic bishop on the Australian continent. 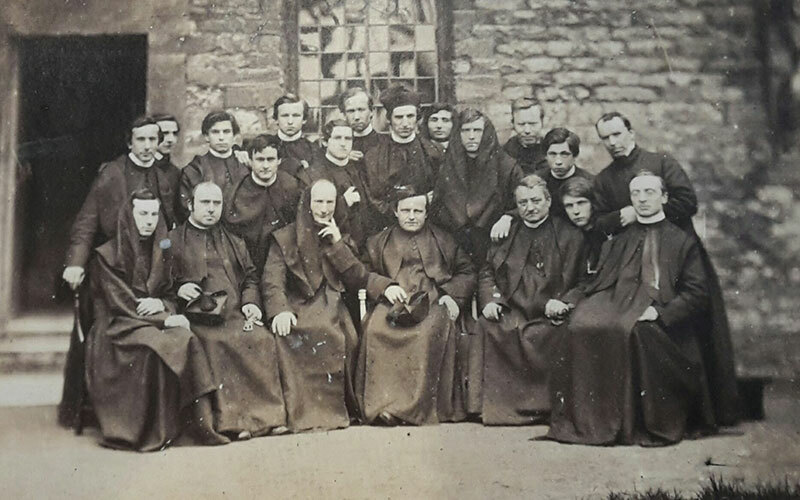 This photograph of 1857 depicts the Benedictine Community of Saint Gregory at Downside. These monks were contemporaries of Archbishop Polding. On Saint Joseph's Day, 1877, was laid in the earth the remains of Australia's first bishop, John Bede Polding OSB. This was in a cemetery at Lewisham (or Petersham as it was then known) which has long since ceased to exist. After his funeral Mass at Saint Mary's Pro-Cathedral (since our present Saint Mary's Cathedral was merely rows of stonework and not yet a building) a vast procession took place to conduct the Archbishop's remains from the Pro-Cathedral to the Petersham Cemetery. At that time, it was the largest Funeral Sydney had ever witnessed. My Lords and Dearly Beloved – I assure you that I feel far too depressed today, after what I have gone through during the last week, to say any words at all, if I did not think that you would feel it as a loss if I did not, in a very short way, express the feelings which animate your hearts now that we are putting away all that is mortal of John Bede Polding, amongst his priests and amongst his people. Such a life as his, and such a work as he has done, you know as well as I do, require long thought and long study, not only to amass but to place before the minds and the imaginations of others in order that they may appreciate his spotless life, and learn the lessons which it teaches. As to myself and my loss, this is not the place I suppose to speak of a personal loss, though what is your loss, what is the loss of each one of us but a personal loss? But I feel it because it leaves upon me a weight which was borne by him, and also because I know more of his former life before he came to this colony than any here present. I know something of his career during the years he was in the some house of religious discipline in which I myself was taught to serve God at early morning and late at night; and I can assure you here surrounding me that there was never anything in this world that had a more powerful action on my spirit, not from what I knew of him by any personal contact, but from the traditions that he left behind him, and from that indescribable influence which, like on opulent flower in a garden, spreads its perfume hither and thither. What he was as a bishop you know better than I do, because you have been in contact with him year after year, and have listened to the sage counsels and gentle reproofs which came from his lips. I will not detain you now in speaking of the works he has effected, or of his great piety, or of the wide-spread influence which he possessed throughout the community. On another occasion myself, or some other person will endeavour to set forth a brief history of his life in the great and exalted position to which he attained, and to exhibit that gentleness, that forbearance, and all those other qualities which take so many years to learn, and which were displayed by him with such great brilliancy. May his mantle indeed fall upon my shoulders, and may I learn from him those lessons I so much need, and may he look upon that Church for which he laboured so indefatigably for many years. And let us in return not forget him. If you would do something for him remember his soul in your prayers, for, however spotless a man's life may be, there is an eye more searching than man's – the eye of the Judge of all men; and, if there be any soil, it will have to be burned out in the purging fires. Pray then that he may receive that reward he longed for in life, and you will have performed the most holy service you can perform to John Bede Polding. Having buried his remains you may free his soul from the penal fires in which it may even now be placed. 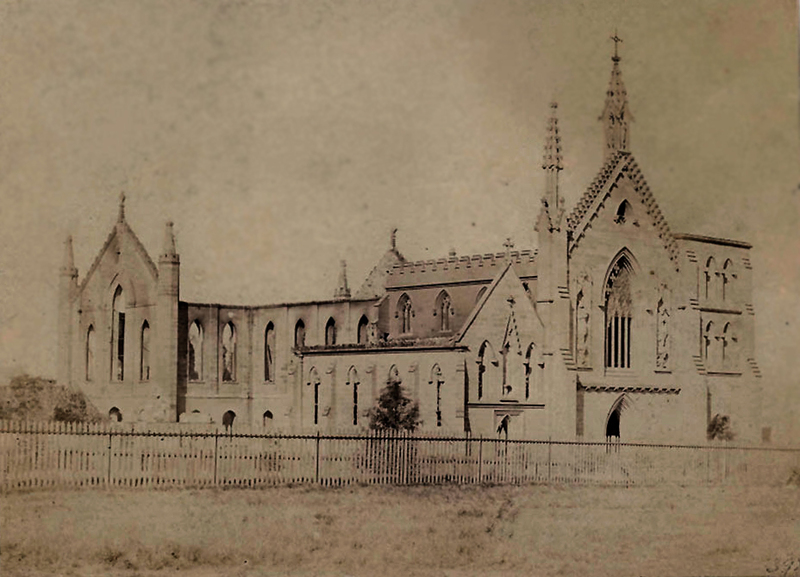 The image presented with this post is a copy made many years ago of a large photograph in the Archives of Saint Patrick's College Manly. 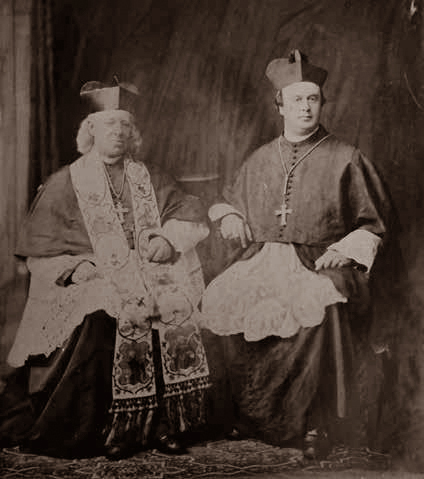 It may be that it is not a "life study", but that the two Archbishops were photographed on separate occasions and then a montage was created to make them appear together. 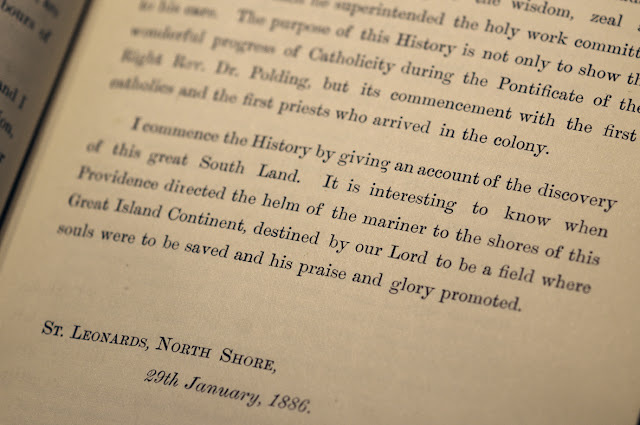 It is intended to make available here articles on the history of the Church in Australia during the 19th century, together with extracts from primary sources, photographs etc., particularly focussing on the life and ministry of Archbishop Polding and his contemporaries. We wish to help a new generation of Australian Catholics to learn about the beginnings of the Church on this continent.